Researchers are converting carnivores into herbivores in a bid to make raising animals such as alligators, trout, and salmon more sustainable. It’s no mean feat turning a meat-hungry predator into a plant eater. The American alligator is an apex predator of southern waterways from Texas to the Carolinas. 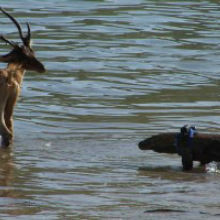 In the wild, adult alligators eat fish, frogs, turtles, snakes, birds, and just about any small mammal they can catch. On alligator farms, the animals chow down on fishmeal and oil processed from wild stocks of sardines, anchovies, and other forage fish harvested from the open ocean. While populations of these fish species have plummeted over the past two decades due to intense fishing pressure, global demand for fishmeal and fish oil has continued to climb, and prices have quadrupled in recent decades. Now, researchers are searching for alternative feed ingredients for alligators and other carnivores farmed for human consumption. Scientists at Louisiana State University (LSU) recently completed trials to learn whether alligators could thrive on mostly plant-based diets. The preliminary results look promising, says Robert Reigh, director of the LSU Aquaculture Research Station. After 11 months, alligators fed primarily soy protein and wheat germ (80 percent by wet weight) were nearly as long from snout to tail as alligators fed traditional fishmeal. Their project is an extension of a multi-decade effort to develop plant-based feeds for carnivorous fish such as salmon and trout. “We are applying what we have learned about nutrition in feeding fish to feeding alligators,” Reigh says. LSU researchers are the first to study plant-based feeds for alligators, but the idea of feeding plants to predators has been around since the 1970s. Over the past decade, scientists have looked deeper into the nutritional components of fishmeal and fish oil. Their findings have helped change the aquaculture industry, which is the fastest-growing food production system in the world. 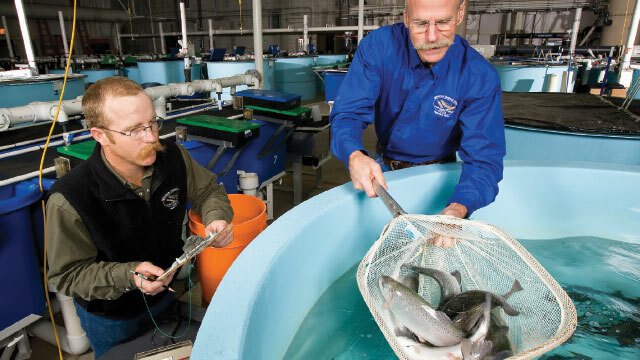 A decade ago, farmers used about three to four pounds of fishmeal and fish oil to grow one pound of salmon. When farmers tried plant substitutes such as soybean meal, the animals’ growth slowed. Yet today it is common to use only one pound of fish to grow one pound of salmon by adding nutrient-enhanced plant feeds. Scientists have learned that fishmeal and fish oil contain a balance of about 40 nutrients, including vitamins A and D, amino acids (such as methionine and lysine), minerals (such as iron, zinc, selenium, and iodine), and long-chain fatty acids. Now, researchers are imitating the balance of those 40-odd nutrients in various plant formulations for carnivores. 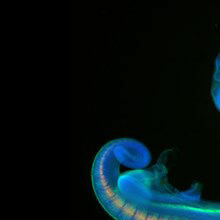 In essence, “we are turning plants into meat,” says Rick Barrows, a fish physiologist with the US Department of Agriculture at the Fish Technology Center in Bozeman, Montana. 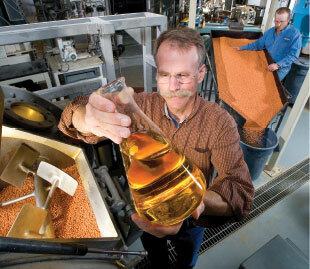 FISH OIL: Rick Barrows (foreground) uses a vacuum coater to infuse flax oil into pellets of rainbow trout feed, containing a vitamin formula that he and colleagues developed. Jason Frost (background) removes feed pellets from a cooling table in preparation for the oil infusion.STEPHEN AUSMUSBarrows and his colleagues have developed all-vegetarian feeds for eight carnivorous farmed fish, including rainbow trout, arctic char, and yellowtail. Atlantic salmon in field studies also thrived on entirely fish-free feed of 92 percent plant-based feed and 8 percent chicken bonemeal. Barrows’s team currently screens dozens of potential feed ingredients each year. “We have a complete analytical lab where we measure the nutrients in the feed, the fish, and the feces, so we can see where the nutrients go,” says Barrows. The most common ingredient today in aquaculture feed is soybeans. Soybean meal is widely available, nutritious, and relatively inexpensive, usually costing about one-quarter of fishmeal’s price. But soybeans, like many other plants, have evolved chemicals called “antinutrients” to discourage predators from consuming their seeds. Soybean’s antinutrients include lectins, oligosaccharides, and trypsin inhibitors. Each anti-nutrient might be harmless alone, but together they can cause an inflammatory condition in some fish called intestinal enteritis, which can reduce growth and produce additional waste that must be cleaned up. “We could only put 15 percent soybean meal in the diet of rainbow trout before their growth started to drop off,” says Barrows. Feed companies can reduce or eliminate antinutrients in soybean meal with processing technologies that “basically wash them out,” says Reigh. “But that is considerably expensive.” In 2014, the cost of feed accounted for more than half of the total operating costs of salmon aquaculture. Researchers are looking for potential feed ingredients that have fewer anti-nutrients. For instance, almond and pistachio meals comprise nuts that are too big or not the right color to meet California standards. These meals traditionally have been sold for cattle feed. The only known naturally occurring antinutrient in pistachio or almond meal is phytate, which can be reduced by adding dicalcium phosphate to the nut meals. 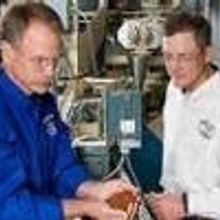 “With a little processing,” says Barrows, “the resulting meal is a very good product for fish feed, and it is being commercially produced and used in aquaculture feeds now.” The new all-plant feeds are more expensive than fishmeal and fish oil, but those prices are likely to come down as technologies and markets are scaled up.